Like all our prior poll posts, this post takes a moment to memorialize the results we received on the most recent blog poll. 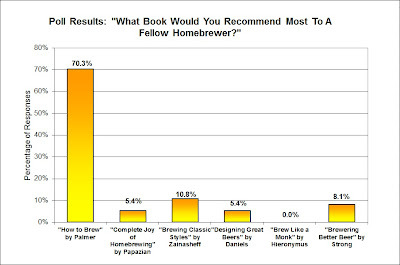 The readers' responses to the question "What book would you recommend most to a fellow homebrewer?" are presented below. The poll question was specifically setup not to ask what book you would give to a "new" brewer, as we felt that question has been overdone. However, because we did not specify this explicitly, the results indicate that most readers took the question in that light - what would you recommend to someone starting out in the hobby. "How to Brew" by John Palmer has become the go-to book for folks entering the hobby and one that just about everyone has in their collection. Even advanced brewers refer back to it from time to time, so the fact that it was the clear winner is no surprise. So assuming the "fellow" homebrewer already has Palmer's book - what next would you recommend? My vote, hands down, was for "Brewing Classic Styles" by Zainasheff. To me, it is a must-have for any brewer as a recipe book reference. I've spoken of it multiple times on this blog (including a number of visual charts generated from it) and the recipe book is the most page-worn reference in my brewing library. With an award winning recipe for every style, its typically the first place I start when exploring a new style. 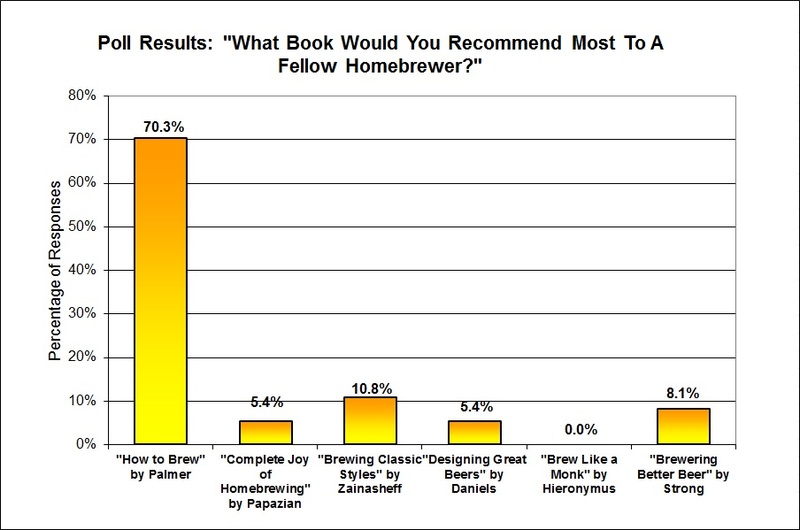 If you favorite brewing book is not listed above, leave us a comment and let us know the title. And if you are reading this, our next blog poll is up and awaiting your participation. "Everybody has to believe in something ... I believe I'll have another drink." Great suggestion! I've yet to read that book, but it is intriguing!